This backgammon games glossary is divided into 3 parts and is dedicated to passionate players around the world. The introduction and extensive learning games section is followed by over 200 backgammon games terms. Backgammon Games Glossary introduction includes a backgammon layout graphic and a learning games section for new players. Additionally, gamerisms believes that backgammon games should be categorized as strategy games. 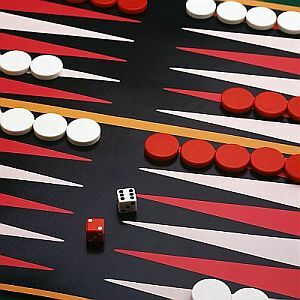 Backgammon is a two-player game, the object of which is to be the first player to move all of your checkers into the opponent's home board and then off the table. It is played on a board consisting of 24 narrow triangles=points, which alternate in color and are grouped into two, each having twelve triangles. The halves are formed by the two opposing sides of the board, with a vertical band down the middle called the ‘bar,’ where the checkers are placed when hit. The points in backgammon are numbered from one to 24, with checkers always moving from high to low numbers. As the players move their checkers in opposite directions during backgammon, the one point for one player will be the 24 point for the other. Each player has 15 checkers and these begin the game with two positioned on the 24 point, five on the 13 point, three on the eight point, and five on the six point in their home board. A pair of dice determines the number of moves available to the players, and a doubling cube with numbers 2, 4, 8, 16, 32, and 64 on its six sides is used to keep track of the stakes currently in play. Two timers govern the game of backgammon. The local timer counts down 45 seconds in normal speed games, 30 seconds in fast games, 15 seconds in express games, in which time the player must make a move. This is reset after each move and, if it expires, the global timer starts ticking. The global timer is set to three minutes in normal speed games, two minutes in fast games, one minute in express games, and only starts ticking when the local timer expires. This global timer governs the entire game. For example, in the case of a game at normal speed, if the player neither moves any checkers nor makes any transactions during the 45 seconds of the local timer, the global timer will start. If the global timer runs out, the player in control of the board will be declared the loser, and points will be awarded to his opponent according to the doubling cube. This will be counted as losing the game, regardless of the current state of the game board. At the start of the game, two of each player’s checkers are positioned on the 24 point, five on the 13 point, three on the 8 point, and five on the 6 point in the player's home board. Before play begins the dice are rolled (one for each player), and the player with the higher number makes the first move, using the combination of his die throw and the opponent's. In the case of a tie, the dice are rolled again until one of the players gets a higher score. If possible, a player must move his checkers the number of points shown on each die. Therefore, if a two and a five are rolled, two separate moves must be made, corresponding to the pips of the dice. The player may move two checkers, or may choose to move only one by combining both numbers. Play continues with players alternating turns after each roll. Each player must move his checkers in a forward direction onto points that the opponent has not already occupied with two or more checkers. If a player rolls the same number on both dice the roll is called a doublet, and each number must be played twice. Once more, all moves are distinct. For example, a player who rolls 5:5 has to play four moves of five spaces, with between one to four checkers. A checker can land on any vacant point. It can also land on any point occupied by a player's own checkers. A checker cannot land on a point occupied by two or more of the opponent's checkers. If a player has no legal moves after rolling the dice because all of the points are occupied by two or more of the opponent's checkers, his turn is forfeited. If a player has a legal move for one die only, he must make that move and then forfeit the use of the other die. If the player has a legal move for either die, but not both, he must play the higher number. Two or more checkers of one color on a point own that point. A single checker is known as a blot. If one of the opponent's checkers lands on a blot, the blot is considered hit, and is placed on the bar. That checker is temporarily out of play. If a player has checkers on the bar, no other checker can be moved before re:entering all of his checkers on the bar. Any checkers on the bar must be reintroduced into the game before any other moves are made. The checker(s) must be entered on empty points or blots in their opponent's home board, according to a throw of the dice. If there are no empty points, the player must forfeit their go. After the last of a player's checkers have re-entered the game, he must play the rest of the numbers shown on the dice if possible. When a player has all 15 of their checkers in their own home board, he can start to remove them from the board; this is known as bearing off. The player can bear a checker off corresponding to each number on the dice—a four will allow them to remove a checker from the 4 point. If there is no checker on the point indicated by the roll, the player must make a legal move using a checker on a higher-numbered point. If there are no checkers on higher-numbered points, the player is required to remove a checker from the highest point on which one of his checkers resides. A player is under no obligation to bear off if he can make an otherwise legal move. A checker that has been borne off cannot re:enter the game. If a checker is hit during bear off, no other checkers can be borne off until that checker re:enters the game from the bar and reaches the player’s home board again. Backgammon is played for an agreed stake per point. Each game starts at one point. If a player is confident of a win, he can use the doubling cube to increase the bet. This must only be done before the player rolls the dice. The doubling cube's faces are numbered 2, 4, 8, 16, 32, and 64. If the second player declines the increase in the stakes, he instantly loses the game and loses a point. However, when the second player accepts the doubling of the stakes he then takes control of the cube, meaning that only he can increase the stakes again. Subsequent doublings of the stake are known as redoubles. If a player rejects a redouble, then they lose the game by the amount of points shown on the doubling cube. Alternatively, the player who accepts the redouble becomes the owner of the doubling cube. The first player to get all of their checkers off the board wins. The loser either loses by a single point, or by the number of points shown on the doubling cube. The loser forfeits twice the stake if he has not moved a single checker off the board by the end of the game. This is known as a gammon. If the loser still has checkers on the bar or in the winner's home board, they lose triple the stake. This is known as a backgammon. This learning games section is followed by the first part of the games glossary. Accept a Double: the stakes for the game have just been doubled as requested by an opponent. Ace Point: the first or 1 point on the board, the closest point to bear off. Ace-point Game or Guff: occurs when a player has 2+ checkers anchored on his/her challenger's ace-point. Player then attempts to hit thereby preventing the challenger from doing so. Acey-deucey: jargon for a dice roll of 1-2. Acting Captain: occurs during chouette when a substitute captain represents the team against the box. Action Play: term for a tactic used to initiate an exchange of hits. Active Builder: jargon for a free builder that is in position to get a point. Advanced Anchor: a made point that is positioned on your opponent's 4 point, 5 point or 6 point. See also, anchor and deep anchor. Ahead in the count/Ahead in the race: occurs when a player has a lower pip count than the challenger. Air Ball: backgammon games glossary term for a roll that gives no advantage. Anchor: a made point on your opponent's home board. Each player begins the game with an anchor (two checkers) on their 24 point, which is their opponent's 1 point. See also, advanced anchor and deep anchor. Around the Corner: occurs when 1+checker(s) moves from the challenger's outer board to the player's outer board. Asset: term for an item that increases the value of a position..
Automatic Doubles: this rule states that if both players get the same number on the first roll of the dice, then a double is called. Backgame: tactic used when a player has 2+ points in the challenger's home board. Objective is to get points in the player's home board and wait it out until the challenger has to open up his/her backboard at which time, it is the player's chance to strike. Bar Point: term for the 7-point. Bar: the dividing line down the middle of a backgammon set where checkers that have been hit sit until they re-enter the game. Bear In: the stage of the game when a player moves his men into his home board. Bear Off: stage of the game when a player has all his men on his home board, and is in the process of moving them off the board altogether. Beaver/Binache: when one player doubles, and his opponent immediately redoubles. Behind in the count or Behind in the race: occurs when a player has a higher pip count than the challenger. Big Play: tactic to take the big move rather than the safe move. Blitz: a style of play in which a player hits his opponent repeatedly in his own home board in an effort to keep him on the bar and close him out. Block: backgammon games glossary reference to point held by 2+ checkers with the intent of blocking a challenger's movement. Blockade: jargon for a series of blocks put into place to curtail the escape of the other side's runners. The best blockade is a prime. Blocking Game: refers to a game tactic that involves building a powerful blockade. Book a Checker: term for covering a blot. Blot: a single checker on a point. This is a vulnerable position. Box: jargon for the single player in chouette. Boxcars/Boxes: term for a dice roll of 6-6. Break Contact: strategy to go forward past a challenger's checkers in order to close the opportunity of any hitting or blocking. Break a Prime: lingo for 1 or more points in a prime. Break the Board: occurs when established points in your home board are surrendered. Broken Prime: term for almost completed prime with the exception of a gap. Build One's Board: movement to make points in your home board. Bump: backgammon games glossary jargon for the action of hitting a checker. Bump and Pass: refers to a 2-step action, hit a checker and move on to anchor with the same game piece. Button Up: term refers to covering a blot and avoiding a hit. This page is the introduction for Backgammon Games Glossary that has 3 parts. The Greek philosopher Plato mentioned the game in his writings and said that backgammon represents the movement of the earth and planets while chess represents war.